This pizza is partly inspired by the Italian tradition of classic pizza with the great cult of our flour and tomato cuisine and is partly inspired by the vegan raw food recipes of Los Angeles. The pizza is called "Pomodoroni" because, in addition to being red as the tomato, it is strongly characterized by the taste of pepperoni. 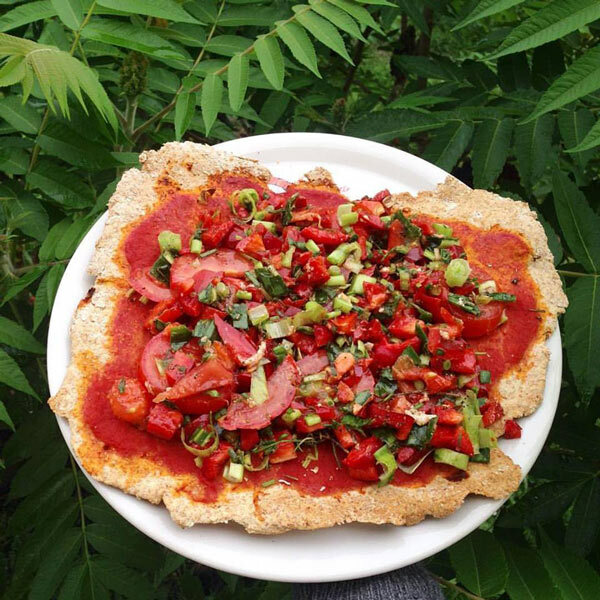 In practice, the pizza is prepared and cooked in a classic way but the filling is added only later, it is very abundant and absolutely raw as in the "fully raw" vegan recipes. All my recipes never have the Ingredients weighed but are calculated only by eye or with spoons, dishes and utensils. The pizzas I propose do not undergo natural leavening because they are pizzas designed for those who have very little time. Put a little lukewarm water in a deep dish, melt half a cube of brewer's yeast, add the oil and then mix all the flour slowly until you get a dough to work and roll out in the oven. Once the dough is placed in the baking tin, roll out the sieved tomatoes on the dough with a wooden spoon. Cut the tomato into slices and the leek and pepperoni into chunks, add the rosemary, salt and pepper, spread over the pizza and finally finish with a tablespoon of raw oil. Use a small 180-degree electric oven for 25 minutes. TIPS: This pizza is very suitable for those who want to eat healthy but abundantly as it is satiating, rich in fibre, with an authentic taste. It is perfect for every moment. It does not include cheeses, but for those wishing to add them, we recommend only local cheeses. If you have chunks of other raw vegetables in the fridge, instead of throwing them, convert them to seasoning.